Prevent others from making changes while you're working. 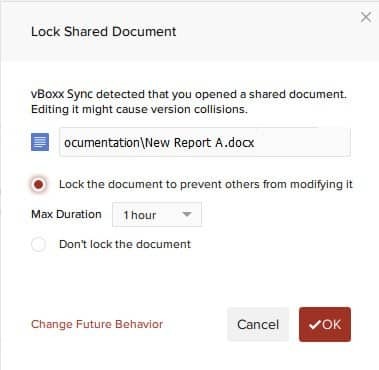 Lock any file or folder stored in vBoxxCloud and choose the specific length of the lock. On the file icon a lock will appear to indicate that the file is locked for editing. Users can still look into the file or create a new copy of the file. Every user can request information about the user that locked the file. Administrators can always override and remove the file lock. If the file is locked by another user, you will receive a "Read-Only" notification while saving.